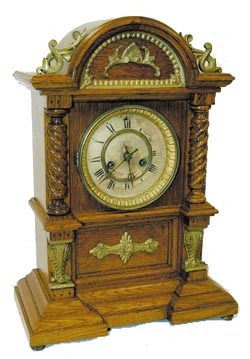 Waterbury Clock Co. cabinet clock, "Jefferson", C. 1891. The company had several series of cabinet clocks, this series being named for presidents and the only clock in this series that had cast brass ornaments. The 16.5" polished oak case has a cabinet finish and is absolutely immaculate and original. The movement is their "Star" model, 8 day, half hour gong strike, rack and snail count, signed, very clean and running. There is a very nice pair of brass hands, brass dial rings, bezel and sash. There is even a Waterbury key. A nice label on the back identifies the clock, but what caught my eye more than the label are two partial labels of central Kentucky jewelers, silversmiths, and opticians, who either sold or serviced the clock in the late 1800's. Ly-Waterbury #811.